Swans Island, about 7,000 acres in size, was first charted by explorer Samuel de Champlain in 1604. Champlain called the island Brule-Cote, or "Burnt Coast." It had long been used by local Indians as a summer fishing and hunting spot. The island was bought by James Swan, a participant in the Boston Tea Party, in 1786. The first permanent white settler was David Smith of New Hampshire in 1791. Smith had 24 children by two marriages and his feats of strength earned him the nickname "King David." Many island natives can trace their ancestry to David Smith. The island developed strong granite, fishing, and lobstering industries in the nineteenth century. Burnt Coat Harbor, on the island's south side, was a valuable sheltered spot. Author Robert Thayer Sterling wrote that "it was in this little place out of the wind and storm sailors found restfulness." Mary Bradford Crowninshield's 1886 book All Among the Lighthouses called Burnt Coat Harbor the "snuggest and prettiest on the coast." 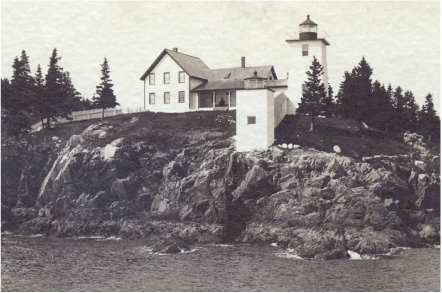 To mark the entrance to Burnt Coat Harbor, a light station was established on the promontory called Hockamock Head in 1872. Two towers were erected to serve as range lights. 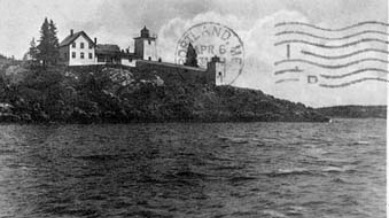 In 1884, after numerous complaints that the range lights were confusing, the front light was discontinued, although the tower remained standing for some years. The range lights which guided to the entrance were unsatisfactory, and a vessel was wrecked last year while trying to make the harbor by their aid. One of them was accordingly discontinued and it is proposed to erect in its stead a lighthouse on Green Island. The Lighthouse Board asked for $12,000 for this new light station. The request was repeated yearly for a decade with no success. The present square brick lighthouse was originally connected by a covered walkway to the 1 1/2-story wood-frame keeper's house. The oil house, still standing, was added in 1895. The bell tower that was added in 1911 also remains, although in disrepair. A foghorn eventually replaced the bell, but there were problems hearing the signal offshore. Wrecks continued near Hockamock Head. Vessels frequently tried to make it into sheltered Burnt Coat Harbor in storms. In the early 1900s, a coal schooner on its way to Bar Harbor tried to make shelter but ran into Johns Island Ledge and broke apart. The crew managed to escape, but the ship's cargo provided fuel for many Swan's Island residents that year. 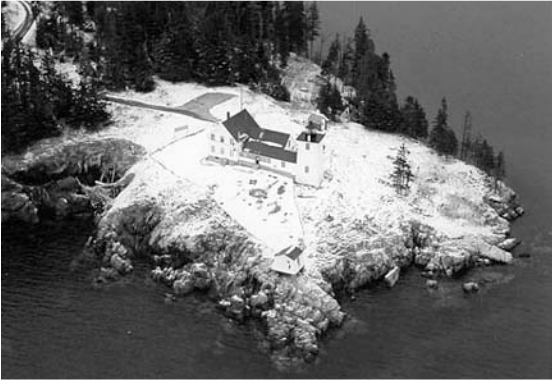 The Coast Guard automated the light in 1975. The original fourth-order Fresnel lens was removed and replaced by an automatic light on a skeleton tower nearby. The new light wasn't as bright as the old one, and after numerous complaints the Coast Guard relighted the lighthouse with an automatic 250mm optic. In 1982, the tower was badly in need of new paint. To save costs, the Coast Guard removed the remaining paint and coated the tower with a sealant. Local boaters complained that this rendered the lighthouse invisible against the dark background, so the Coast Guard gave the tower a new coat of white paint. The station became the property of the Town of Swans Island in 1994. The light was converted to solar power in 2002. A committee was formed to oversee the management of the property. With nobody living at the station and no regular maintenance, the property quickly deteriorated. In 2002, the town received a grant from the Virginia Wellington Cabot Foundation for an architectural assessment of the keeper's house. A thorough study of the building was completed by Bar Harbor architect Roc Caivano, and the town initiated a comprehensive restoration plan. 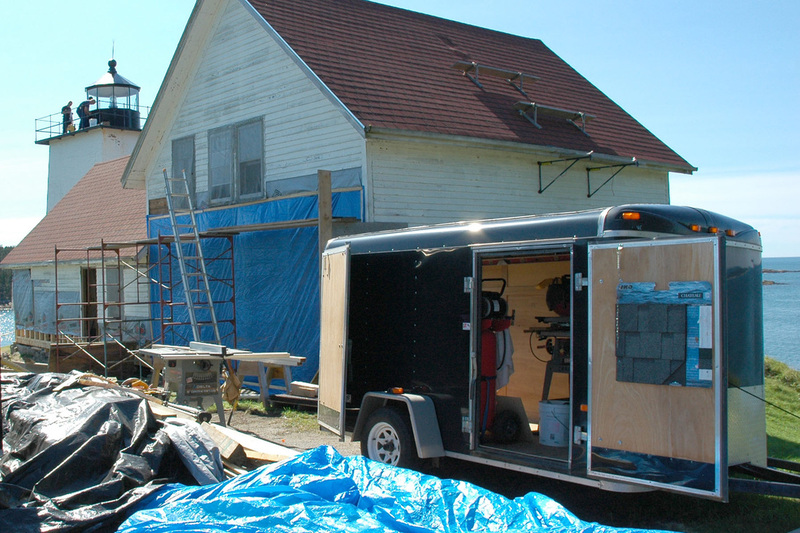 A $15,000 grant was received in April 2006 from the MBNA Foundation Conservation Grants Program. 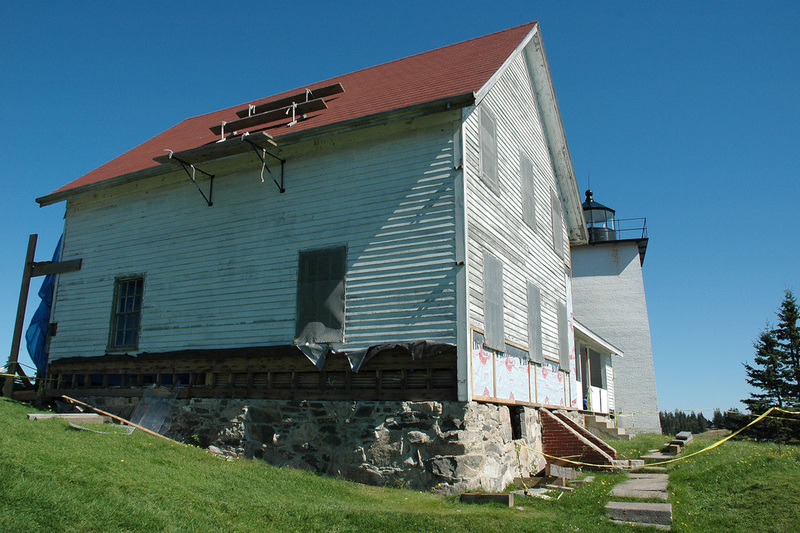 Combined with private donations and funds from the town, this allowed the work on the exterior of the keeper's house to begin in the summer of 2006. The entire roof had to be re-boarded, then covered with Hatteras Red asphalt shingles. A grant of $7,500 was also received in 2006 from the Maine Historic Preservation Commission's New Century Community Program for a survey of the windows in the keeper's house and their repair or replacement. The survey led to the discovery of problems with the building's foundation. In addition, the town received a $7,500 matching grant from the National Trust for Historic Preservation. The funds were used to obtain professional expertise for preservation planning for the light station. A plan was prepared by Annabelle Radcliffe-Trenner of Historic Building Architects. 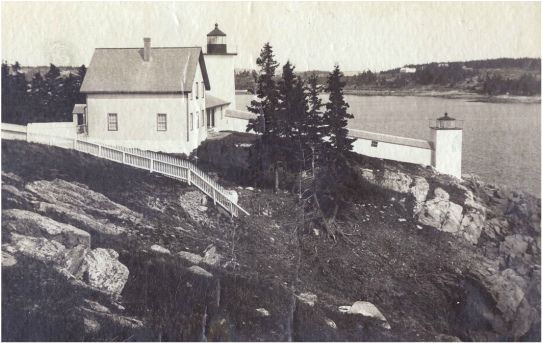 The nonprofit Friends of the Swan’s Island Lighthouse have now taken responsibility for restoring, managing, and maintaining the light station buildings. The Town recently received a comprehensive report from Resurgence Engineering of Portland setting out a work plan for complete restoration of the tower. Professional preparation of the work plan was financed by grants from the Maine Department of Transportation (Small Harbor Improvement Program) and the Davis Family Foundation. Individual gifts made up the balance. As to the keeper’s house, we will focus first this summer on completing the downstairs rooms. This will include installation of kitchen facilities (in the old kitchen area) and bathroom facilities (in the closed off area to the left of the main entrance). Another task that must be done this year is to improve ventilation through installation of roof and soffit vents. Structural strengthening of the oceanside porch is also on the agenda. There are two other construction or restoration tasks that we expect to complete this summer. The first is moving the fog bell from its present location near the ferry terminal back to Hockamock Head. It will be placed on a simple granite base in the area near the electrical meter, with appropriate landscaping and an explanatory plaque. The second is replacing the flagpole, which was shattered in a winter storm. Hinckley Yachts has promised the gift of an appropriate mast for that purpose, and we are presently working on arrangements to have it transported from Rhode Island to Swan’s Island. 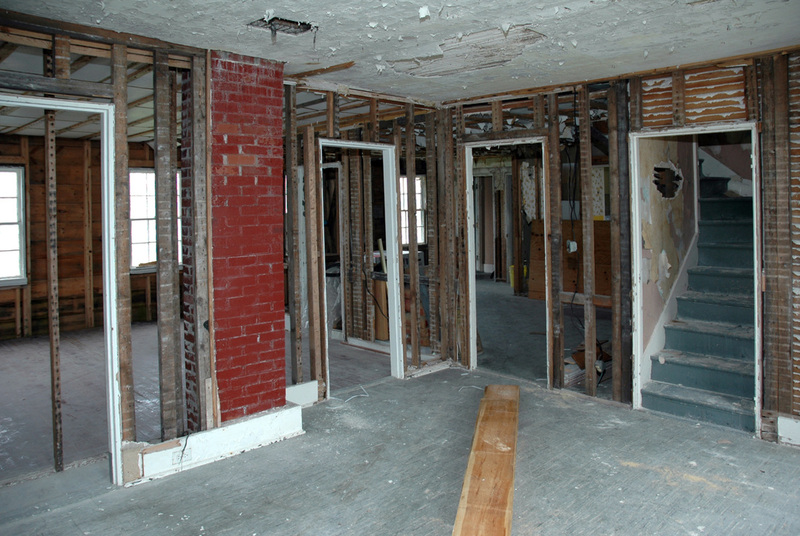 Below: Photos taken during restoration work in 2006 (courtesy of Donna Wiegle).